Ajax has closed the training camp in Florida with a 4-2 victory over Sao Paulo. Earlier on Saturday, Feyenoord in Marbella won 4-2 against Karlsruher SC. Ridgeciano Haps made his comeback after months of injuries. 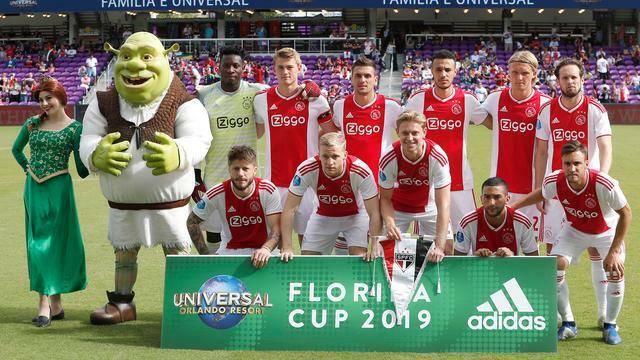 Ajax has closed the training camp in Florida with a 4-2 win at Sao Paulo. Earlier on Saturday, Feyenoord in Marbella won 4-2 against Karlsruher SC. Ridgeciano Haps made his comeback after months of injuries. Where Ajax coach Erik ten Hag on Thursday against Flamengo (2-2) still appealed to his second choice, if the base was to show against Sao Paulo. That meant that players like David Neres, Lisandro Magallán and Joël Veltman started on the bank. The Amsterdam-team came in behind after fifteen minutes in Orlando. Hernanes appeared after a sloppiness by Daley Blind for the goal of André Onana and shot dry. Only in the second half did Ajax reach 1-1. After a cross from Noussair Mazraoui, substitute Rasmus Kristensen found the completely free-standing Donny van de Beek, who shot close at hand. With a Brenner hit, however, the number two of the Premier League quickly faced a backlog, but Dusan Tadic brought both teams from a penalty to the same level. The Serbian gave the cross from Kasper Dolberg 3-2 ten minutes before time. Frenkie de Jong sent Tadic deep, who only awarded the Danish striker the goalkeeper. In the final phase, Neres determined the final score against his old club at 4-2. The Brazilian was shot on the list of the Jurgen Ekkelenkamp, ​​who had also come in. Ajax resumes the competition on 20 January with a home match against sc Heerenveen. Four days later, the Frisians return to Amsterdam for a duel in the quarterfinals of the TOTO KNVB Cup. Robin van Persie opened the score for Feyenoord in Marbella after eight minutes. Less than a minute later Luis Sinisterra doubled the margin for coach Giovanni van Bronckhorst's team. After Marvin Pourie had taken care of Karlsruher's goal-striker moments later, Van Persie expanded the lead halfway through the first half. Even before half time, Burak Camoglu did something back on behalf of the Germans, who played in the Third Bundesliga. Mohamed El Hankouri determined the final score shortly after the break from a penalty. Haps started in the base and made his first minutes of play this season. The left back was injured in the preparation at the beginning of July by his tibia. The return of the 25-year-old Haps is a bit faster than expected, because Feyenoord initially took into account that he could only get back into action after the winter break. Van Bronckhorst opted against Karlsruher for eleven other names compared to the exhibition game with Borussia Dortmund, which was too strong 2-1 on Friday. Among others, Kenneth Vermeer, Van Persie, Orkun Kokcü and Sinisterra received a basic place. Feyenoord prepared itself in Spain for the second half of the season. The number three of the Eredivisie resumes the competition on Sunday, January 20 with an away match against PEC Zwolle.